Let’s face it, we love outdoor living here in Arizona. The indoor and outdoor lifestyle has been changing and backyard trends have changed right along with them. Take a look at some of the top pool trends we’re seeing. Variable-speed pool pumps can make a big dent in your annual energy bill. 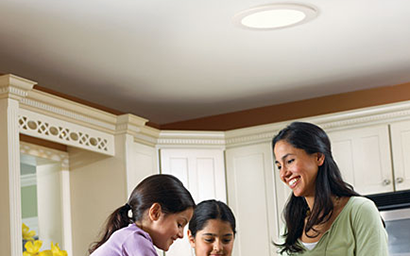 In fact, after a generous rebate from your power company, standard use will save you an average of $500 per year. The idea is simple and relies on no new or untested technology. It simply is variable speed. It cycles through different speeds. Full speed to run your pool cleaner, slower speeds to simply circulate the water and distribute chemicals. People are replacing their underwater light with lights that cycle different colors. They’re increasingly leaving their underwater light alone and adding colored LED lighting under the decking edge. This creates an ever-changing perimeter glow. Really different. Really beautiful. More and more homeowners are remodeling pools to create a design that is more natural and organic. Natural decking materials, which include stone like travertine, are very popular and continue to set off any pool in spectacular fashion. Ditto for water line tile. There are lots of natural choices that blend with both more natural decking and interior pool surfaces such as Baja Pebble. Want an oasis? Your landscaping, decking and tile can be an important part of this overall look. Fire and Water – Features, that is! Everybody knows about fire pits, but we’re adding fire to many places you might not expect. Like scuppers and waterfalls! And speaking of water features, the list of choices continues to grow. Sconces, scuppers, waterfalls, jets and more can accent any pool remodel with interest and flair. 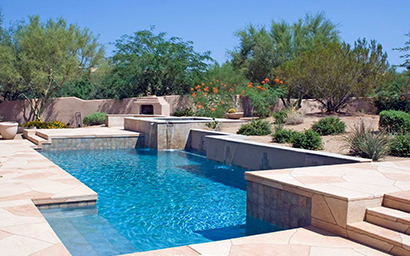 Unique ledges are becoming very popular among pool remodeling. Ledges are a wonderful place for kids to play in a foot or two of water. AND, attention parents and grandparents, as importantly, can accommodate lounge chairs and an umbrella. These types of ledges allow people to enjoy the water without fully getting in. Aggregates can include additions such as mosaic pieces and “highlight materials,” materials that reflect sunlight. A popular addition has been “Pool’s Gold,” gold flakes mixed into the Baja Pebble pebble pool surface. 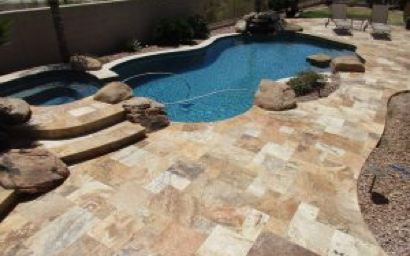 These are just a few trends that have come into the spotlight, so be sure you talk to an Arizona pool remodeling professional, such as CDC Pools, before you make any big decisions and learn the best options for redoing your pool.